Here at the Middle Stump, we have gone Olympics nuts. Like mosquitoes on a nudist beach, we don't know which sport to have a nibble at, and Thorpster took a trip down to HQ in NW8 for a look at the archery. Being a self-confessed sporting nut, I asked my brother who has become Olympic crazy to count me into his online application for Olympic tickets. In a way I struck lucky as I got tickets to four events, one of which was archery, which was to take place at Lords, the home of cricket. 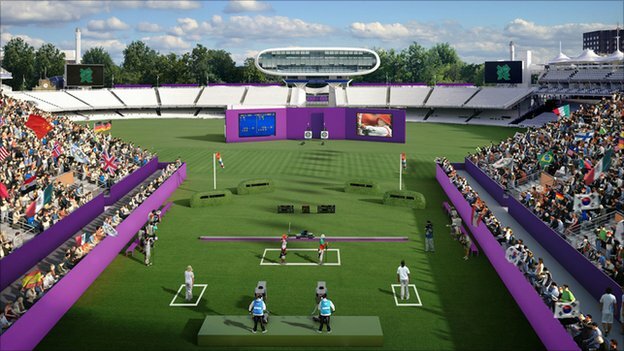 Having been to Lords on numerous occasions over the years, I was looking forward to seeing how being there for the Olympic archery tournament differed from being at an international or county cricket match. As I arrived at St Johns Wood station, I was struck by how quiet it was. But as my old man remarked Lords, (like Wayne Rooney’s favourite service providers) is well used to handling large numbers. For the archery the capacity was somewhere around 6,000 or about 20% of the 28,000 capacity for cricket. 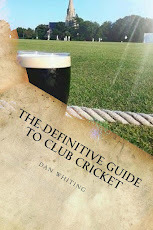 There was however an air of excitement and anticipation as there would be before a big test match, ODI or major domestic occasion (or a visit to the scouse sauna), as I headed towards the ground. There were a plethora of “witty” comments flying around as it started to spit with rain such as “I bet Mick’s putting the covers on or “it’ll be swinging around today, in these overcast conditions”, as I headed towards the Grace Gates. Entering the ground further jokes were fired out, as when a bloke in a group 4 uniform walked past one wag came out with, “at least one of the buggers turned up”. Walking towards my seat I noticed expectant fans milling around the bars and cafes and in and out of the museum, as they would before the start of a days cricket. The set up in terms of where the stands were situated was slightly unexpected. Wanting to avoid the old Wembley scenario of fans being a KP hit away from the action area, temporary stands had been erected at extra cover and wide mid on, looking from the pavilion (wouldn't they have made it more interesting to have the cheaper seats in the Nursery End? - ED). The organisers were obviously under strict instructions to avoid the square at all costs, to which those involved paid particular care. Looking on from the stands on the outfield, it struck me how small the stands are at Lords, particularly when compared to large modern sports stadia. That of course is part of the charm of HQ along with the fact that everyone has a good view, unlike places like Old Trafford or the San Siro, where during one AC Milan v Arsenal game I was so high, I thought I was Dermot Reeve. Sticking with distance, having had a sneak preview on TV before hand, the archers were a lot further away from the target than I thought. 70 metres to be precise, but it also demonstrated how short the straight boundaries at Lords are. As the action began, it was strange to hear the yankee twang of an American commentator ringing out from the pavilion. There is no doubt that Archery is a very skilful sport and that the trajectory upon which the arrows are launched varies far more than it appears when watching on TV. Like a cricket ball the arrows swing about in the wind and like golf, the height of the shot is often dictated by the swirl of the wind at the time of fire. One thing that was the same as at a big cricket match at Lords was how pressure affected those delivering the projectiles. Like Steve Harmison with his famous first ball of the Ashes or Scott (Tommy Rundler) Boswell for Leicestershire in the 2001 C and G final, the participants were affected by the magnitude of the tournament. The Americans had the top 2 seeds, with the number one, the delightfully named Brady Ellison. He was happily firing in scores of 9 and 10 (the maximum) until the pressure came on when his arrows wobbled about more than Richard Ellison wobbled the ball to have the Aussies in disarray at 37-5 at Edgbaston in 1985. Depending on the wind some tossed the arrows up like Shane Warne in his pomp, while others fired em in like Ernie Emburey in 1989. The star attraction for team GB was Simon Terry who apparently had first appeared in the Olympics at Barcelona in 1992. He got through the first round but then faced up to the Moldovan bowman, Dan Oluro, when unfortunately he was about as effective as Paul Terry facing up to Winston Davis at Old Trafford in 1984. Unlike Paul Terry, fortunately only Simon’s dreams of a medal were shattered. A bit like cricket the audience’s attention levels rose and waned as that day went on. From focussed concentration in the early afternoon session, to fractured indifference in the early evening. At test matches this is usually caused by vast amounts of lager being consumed. Whilst there was some of the amber nectar being downed, the reduction in focus was more down to boredom setting in as the novelty wore off as the day went on. Like a rain affected day at the cricket due to some close run contests, things dragged on past the published time for stumps. Another thing that the archery had in common with the cricket was the fancy dress, with many humorous lads dressed as Robin Hood, Friar Tuck and the sheriff of Nottingham. Unfortunately unlike at a test in the home city of Robin Hood, there were no telly tubbies, Freddie Mercury’s, or Jimmy Savilles stumbling around at tea time. As stumps were drawn at about 7pm and the crowds drifted back towards the station, I reflected on an enjoyable if slightly surreal day at the home of cricket. When compared to a days cricket, there is only one winner but it made a change not to be absolutely Frank Hayes’d by 2pm in the afternoon.